Construct a 12.8-mile trail along the Santa Ana River Trail (SART) system, connecting Orange, Riverside, and San Bernardino Counties. This portion of the trail along the Prado Basin would facilitate pedestrian, equestrian, and cycling trail use with nature-viewing opportunities, and provide a non-motorized transit route that does not otherwise exist in the area. The Riverside County Regional Park and Open-Space District (Riverside County Parks), in cooperation with the US Army Corps of Engineers (USACE), the County of Riverside, the City of Corona, the City of Norco, and the City of Eastvale, proposed the construction of this 12.8-mile section of the Santa Ana River Trail (SART) system, which when completed will provide the only direct trail connection through Orange, Riverside, and San Bernardino Counties. 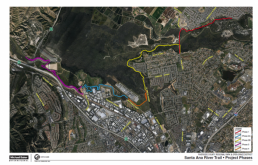 The proposed section of trail in Prado Basin would facilitate pedestrian, equestrian, and cycling trail use with nature-viewing opportunities, and provide a non-motorized transit route that does not otherwise exist in the area. The 12.8-mile section is located in western Riverside County. A recreational trail that will follow the Santa Ana River from the San Bernardino Mountains to the Pacific Ocean was envisioned more than 100 years ago. 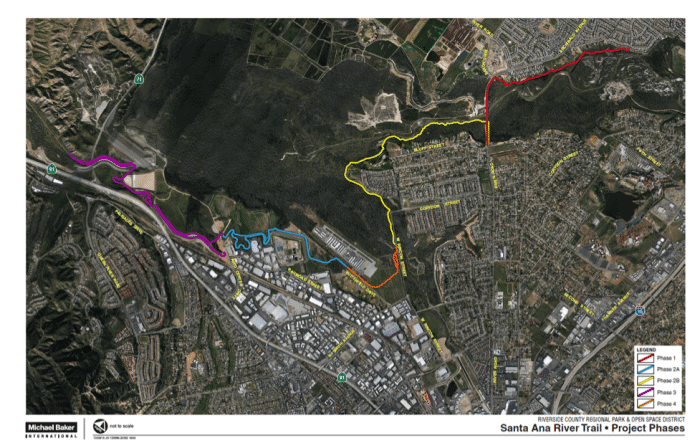 In 1955, the concept of a Santa Ana River Trail and Parkway was formalized among agencies. Once completed, the regional SART would extend nearly 110 miles from the Pacific Ocean in the City of Huntington Beach to the Pacific Crest Trail in the San Bernardino Mountains. As envisioned, the majority of the 75-mile segment from Huntington Beach to San Bernardino County would be a dual-track trail consisting of 1) paved Class I and Class II Bikeways for bicyclists and pedestrians and 2) decomposed granite (DG) surfaced riding and hiking trail for equestrians, mountain bicyclists, and hikers. Where feasible, the paved bikeway and DG trail would run parallel to each other, although the alignments would diverge if constrained by technical or biological conditions. This is consistent with existing built reaches of the SART in Orange and Riverside Counties. In Orange County, most of the trail and bikeway systems have been completed; approximately sixty percent is complete in Riverside County; and over 75 percent is complete in San Bernardino County. These existing built reaches of the SART currently serve the needs of recreational pedestrians, bicyclists, and equestrians, and provide some commuters an opportunity for alternative means and routes of transportation. The original project design was based on a review of opportunities and constraints that could assist trail designers in having the best trail capable of satisfying the goals of a trail system paralleling the Santa Ana River where feasible, and connecting with the upstream and downstream portions of the existing SART system. Following the Master Plan phase that was completed in 2012, steps for final design on the approximately 12.8 miles of Phases 1 through 5 were initiated. Maximize avoidance of environmental impacts. Provide facilities for bicyclists, equestrians, and pedestrians. Have connections to neighborhoods and other trails. Meet Americans with Disabilities Act (ADA) standards where feasible.